Grace and mercy and peace be to you on the Christmas Eve, from God our Father and the baby born of Mary in the little town of Bethlehem. This evening, we have come here to hear once again the Christmas story. And as familiar with it as we may be, we never tire of hearing it because of its sublime beauty. Tonight, we heard the Christmas story from three perspectives. In the Old Testament readings from Genesis and Isaiah, we heard the Christmas story as it would have been told to those who lived before it happened. They were like little children who waited anxiously for Christmas day to finally arrive. Their parents and grandparents would have told them the story over and over again about how God had promised that an offspring from the woman would come into this world to crush the head of the devil who had brought darkness and gloom and suffering and death into the world. Then we heard the Christmas story as told by those who were there when it finally, actually happened. St. Luke interviewed Zachariah and Elizabeth, Mary and Joseph and the shepherds – and all the eyewitnesses that saw and beheld and held what those “fourteen generations from Abraham to David” and those “fourteen generations from David to the deportation to Babylon,” and those “fourteen generations from Babylon to the Christ,” had so eagerly longed for. This is undoubtedly the ‘Christmas story’ that we’re all most familiar with and never tire of telling and hearing. There was a man by the name of Joseph and his betrothed named Mary. There’s really nothing all that special or noteworthy about either of them really. In fact, the only thing we’re told about them is that both of them could trace their family tree all the way back to David – which put squarely in that line that would lead to the Messiah. Late in her pregnancy, Joseph and Mary had to travel south, from Nazareth in Galilee to Bethlehem in Judea, because the king wanted to get an accurate count of how many people he could collect more taxes from. Everyone was required by law to register in his ‘home town,’ which for both of them, was Bethlehem. Joseph and Mary had a hard time finding a place to stay. Lots of people had come from far away to register. Rooms with spare beds were like hens teeth. So Joseph did the best he could for his very expecting wife and found a place to at least escape the elements. We’re not told how long they were there before the time came for the child to be born. The baby was wrapped in the kind of clothes that babies in those days were wrapped in. Since there was no crib to lay their newborn baby in, one of them must have said that the animal’s feeding trough was just the perfect size and shape and if they could only borrow it for a little while they would be so grateful. 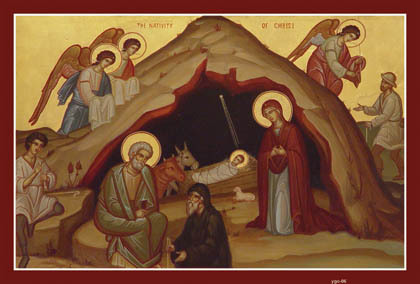 So the laid their newborn baby, their “Wonderful Counselor, Mighty God, Everlasting Father, Prince of Peace” in a manger. We can only wonder what the cows and the sheep must have thought of all that. And since shepherds back then didn’t have cell phones or GPS, the angel gave them some coordinates, that if the would follow them, they would find the child. And off these shepherds go, leaving their sheep behind, to “see this thing that has happened, which the Lord has made known to us.” And we can only wonder what the sheep must have thought about all of that. Sure enough, they found the baby, just as the angel said they would. They told their story to Mary and Joseph, and then ran back to their flocks “glorifying and praising God for all they had heard and seen…” And I wouldn’t be surprised if a lot of people in Bethlehem weren’t wakened from their sleep and asked each other what all the racket was about. That's the Christmas story that we are all most familiar with. Mary, Joseph, baby Jesus, Bethlehem, angels, shepherds. We usually throw in a donkey, a barn and a very rude innkeeper who didn’t have the heart to make some room for an expectant woman, although none of that is actually in the text at all. This evening however, we have ALSO heard the Christmas story as it is told, not from the perspective of those who lived beforehand or from those who were eyewitnesses to the actual event itself, but from a transcendent perspective that connects together the past with the present and the future into the eternal and infallible will and purpose of almighty God Himself. “In the beginning was the Word and the Word was with God and the Word was God. He was in the beginning with God. All things were made through Him and without him was not anything made that has been made… And the Word became flesh and dwelt among us.” When was the last time you sat your children or grandchildren on your knee in front of the Christmas tree and told them the Christmas story like that? Of course, it’s all one and the same story. But this is the cosmic story of Christmas that no one who lives in time and space and human history could ever begin to imagine unless God Himself told it to us. Only God, who was in the beginning, can tell us that the baby born to Mary in Bethlehem is none other than the eternal Word through Whom the world was created. Tonight, we hear the incredible story once again that the baby born of Mary is not simply a special child, but that this baby is God Himself. Mary is not just the mother of Jesus but she is the mother of God. The One who orders the history of the world from the first day of creation to the last day of the world, entered into history when the time had fully come. The infinite is contained in the finite. So, when we are told that the baby born of Mary was in the beginning, and the One through whom all things were made, let us also to see that this child wrapped in swaddling clothes and lying in a manger is the One through Whom God is making all things new. By His coming into His creation, by taking on our humanity and living in the course of time and space, we see that He has no intention of destroying His creation and starting all over again. That would have been the easier and far less painful thing for Him to do. Rather, He enters into it. For His intention and desire is to renew and redeem it from the inside – one person at a time.